There has never been a more a crucial time for a business to maximize its online presence in the savviest, most effective way possible. There are so many companies with great products and services, but if your company is buried in search results to the point that consumers can’t find you online, you essentially don’t exist. iCrye solves this problem through Holistic Search Engine Optimization. At iCrye Digital Marketing, we take into account your entire online presence. We do extensive research of your customers as well as your competitors and create a customized strategy based on the results. Knowing what your customers are looking for and providing that consistently on targeted online platforms, produces sustainable results, faster. Many factors go into where you rank on a search engine page. There’s no such thing as a “one size fits all” strategy. 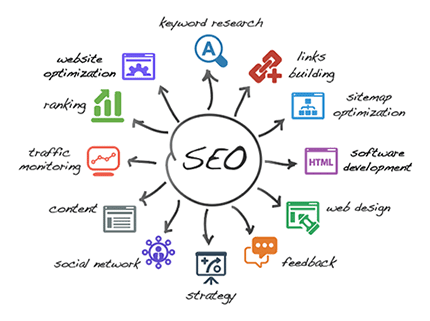 That’s why we customize our SEO based on your business goals, target market, current customers, prospects and budget. Getting you to rank on the first page of search engines is our goal. It’s what we do. iCrye Digital Marketing’s SEO strategies improve your online presence, increase traffic and conversions and sustain higher rankings for your website. iCrye Digital Marketing is a full-service SEO agency. Our base of operation is in Los Angeles, California. We help businesses solidify their on-line presence and increase their conversion rates.